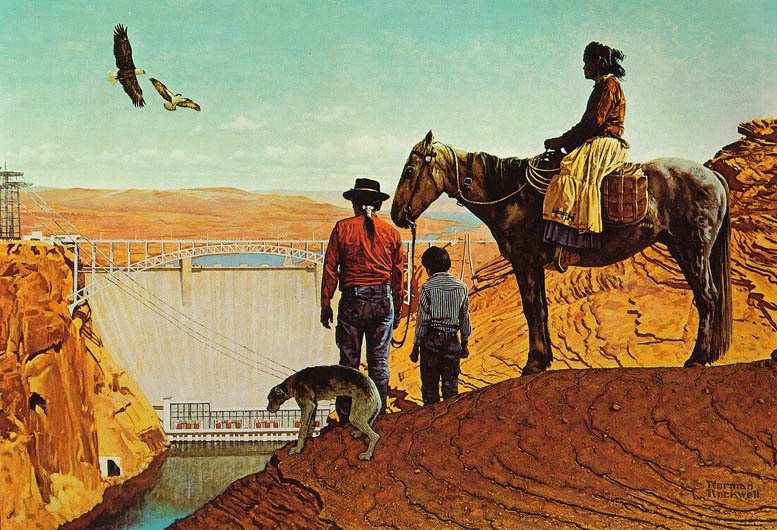 Woody and his songs came to mind as I started thumbing through Dams, Dynamos, and Development: The Bureau of Reclamation’s Power Program and Electrification of the West, a handsome, large-format book published for the centennial of the Bureau in 2002 and now back in print. 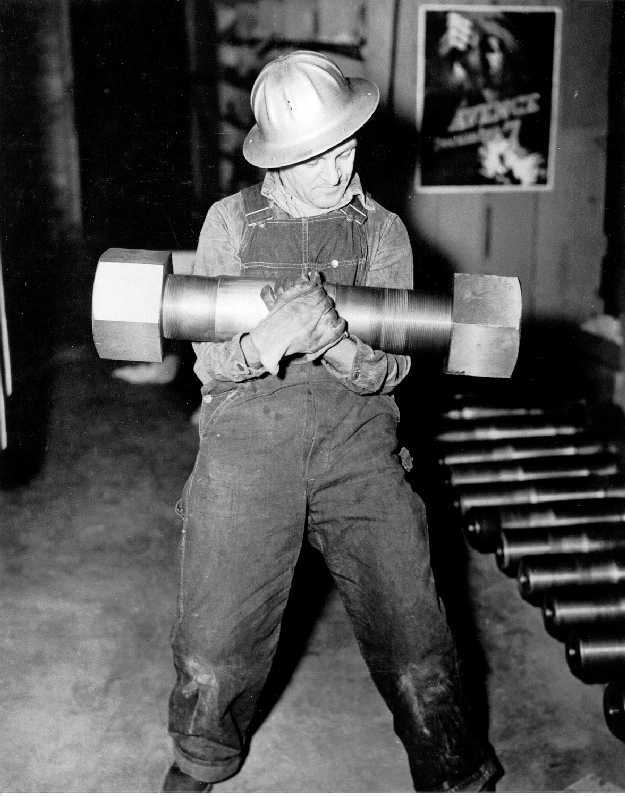 It includes a broad array of wonderful black and white and color photos, as well as reproductions of art work (even a Norman Rockwell, left), all of which illustrate the history and activities of the Bureau in building dams and power plants to generate electricity. Many of the photos capture Woody’s “big Grand Coulee country in the land I love the best” and the other rivers and canyons of the West. 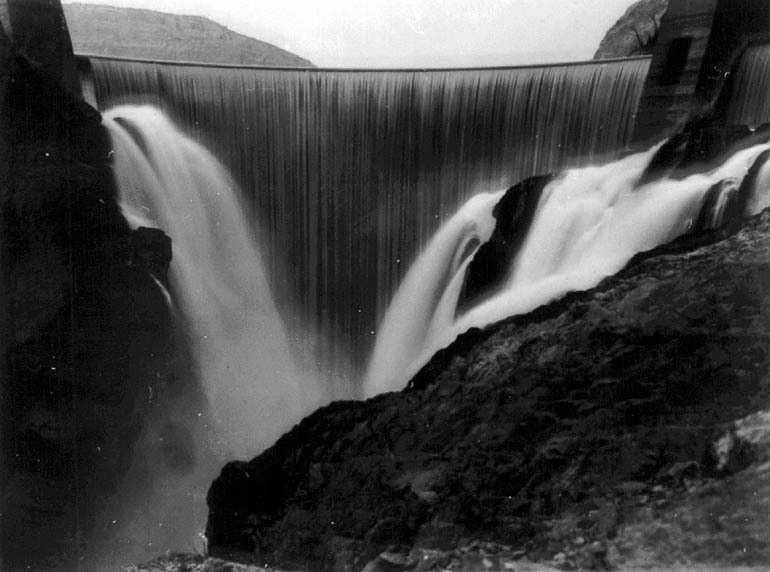 It’s not just a picture book; there’s also a lot of hard information on the history of the program, the changing views of the effects of dams and hydropower facilities on the environment – even an extensive listing and photo gallery of the 58 power plants that comprise the Bureau’s power network. It conjures up the heroic age of building America’s infrastructure while addressing such issues as alternative power sources and environmental protection. You can get a copy of this excellent book here or find it in a library. 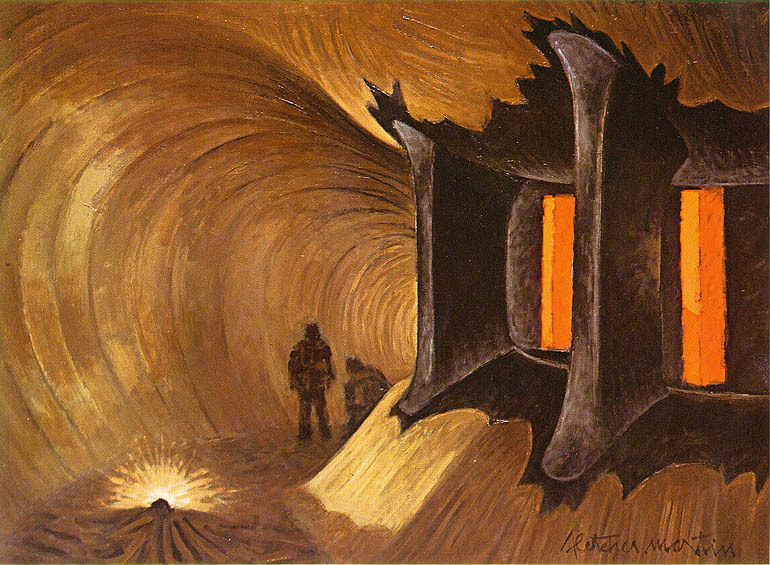 If you want to view some of the art work, check out the Bureau’s American Artist and Water Reclamation Web page; for some of the photos, there’s the Bureau of Reclamation Photography and Engineering Drawings Collections page. This entry was posted on Wednesday, January 19th, 2011 at 9:28 am and is filed under Bureau of Reclamation. You can follow any responses to this entry through the RSS 2.0 feed. You can leave a response, or trackback from your own site. posts which consists of tons of valuable data, thanks for providing these information. I was really fascinated at the way dams have been built, especially in the US. This book would be a great read. Does it cover Floyd Dominy, David Brower, etc. and Glen Canyon? Yes, pages 119 through 122 of Chapter 10, “Reclamation and the Environment,” discusses David Brower, the Sierra Club, and the Glen Canyon controversy, and quotes Floyd Dominy. Woody was hired to write 30 songs in 30 days -some bureaucrat’s idea of a reasonable rate of labor. He managed 28. I could probably write 28 songs in a month but I sure as heck wouldn’t come up with all the classics he put together. On the other hand, it’s pretty impressive that he was hired at all. Unfortunately, I couldn’t find an online version you can look at. You could check at a library to see if it has a copy. 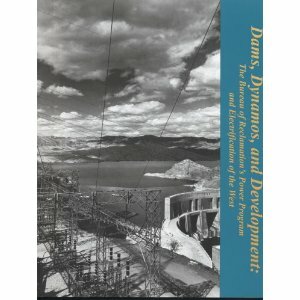 “DAMS , DYNAMOS AND DEVELOPMENT” IS A EXCELLENT WORK!THIS IS NOT JUST A PICTURE BOOK!THIS IS A UNKNOWN SIDE OF THE HISTORY OF U.S.A.!CONGRATULATIONS!